This work is recorded by the Henry Moore Foundation as no. HMF27a. Given by the artist to a colleague at the Royal Academy, by whom sold to the present owner, circa 1991. A. Garrould, Henry Moore, Complete Drawings, I: 1916-29, London, 1996, no. AG 21.37, p. 34, col. pl. 1. 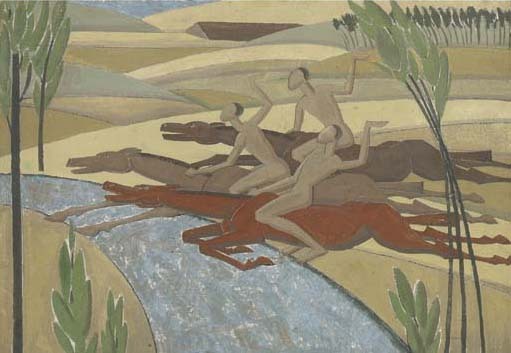 The present work was probably painted as one of the 'monthly compositions' required by tutors at London's Royal College of Art, where Moore enrolled in 1921. Other known examples include, Two nudes among trees, circa 1921 and The Newspaper Seller, 1921 which are both in the collection of the Henry Moore Foundation (see A. Garrould, op. cit., nos. AG21.36 and and AG21.38).